Ben J. Raber passed away about 2 weeks ago. He was the second owner of Raber’s Bookstore, taking over the store in 1967 from his father John A. Raber. Raber’s best-known publication is the annual Almanac (first advertised as Der Neue Amerikanische Kalender für das Jahr 1930 in the Sugarcreek Budget) which contains an Amish ministers’ listing along with astronomical and church information. Raber’s has not necessarily encouraged the trend to English, Luthy notes, with the vast majority of books actually published by Ben and his father being in German, with a number focused on the study of the German language (at least at the time of writing). See “A History of Raber’s Bookstore”, Family Life, March 1982, for more. Today Raber’s sells a range of both German and English titles. 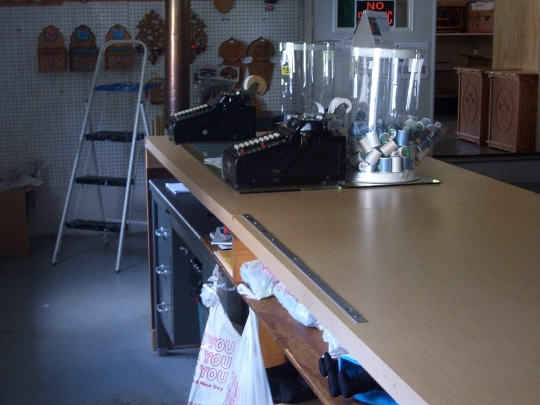 You can visit Raber’s at 2467 County Road 600 Baltic, Ohio, or have a look inside the shop at this post on Raber’s Bookstore. I was on Suzanne Woods Fisher’s radio program a couple of weeks ago, and somehow I forgot to mention it (we had pre-recorded since I was going to be back in Poland at the time of airing of this 2-year anniversary show). You can listen here (the 3rd link down). As usual we had a fun conversation on a wide variety of Amish topics. Do you remember the tragedy of last summer, in which an impaired driver in New York caused an accident which killed 6 Amish people? A sentence of 12 to 24 years was handed down earlier this week. Steven Eldridge admitted to being high on cocaine and prescription drugs at the time. After posting this week about the Amish and fracking I came across an article on plans to expand silica sand mining in the vicinity of a Wisconsin Amish community. Amish and other residents are concerned over traffic and effects to the environment. I used to use an adding machine like that, back when I helped do the farm bookkeeping for a neighbour. That was…before you were born. Thanks for the “round up” its always interesting to read!! I wonder if Mr. Raber’s family will carry on with the store and almanac? My prayers go out to his friends and family. Magdalena, before Erik was born I was working in a local grocery store. We had no adding machine, caculator or cash register. We added everything up on the back of a paper bag. 2 collums, one for taxable and one for non taxed items. Back then the only thing taxable was cleaning supplies, paper towels and the like. We had one lady that always bought two grocery carts full every week. Oh boy was that fun to add up!! I don’t think most young people today could do that kind of adding at least not without some sort of a machine to help them, LOL. Glad you liked it Alice, and Raber’s is running as far as I know–daily operations had been in the hands of others for some time before Ben Raber’s passing. OK now I feel older, I was working in that store lonnnng before you were born, LOL. It was my very first “on the books” job. Finally finished listening to the show. It was very good and informative Erik. I especially liked the discussion towards the end where you were discussing the different Amish groups. I think folks tend to lump them all together not realizing each district can have different beliefs. I am glad I took the time to listen even though I did have to stop it a few times for my cooking. Glad you liked it Alice, I always enjoy talking to Suzanne. Sounds like I need to get my accent under control! The adding machines in the picture are the type that I used when I started working in an office many years ago. When the new “fancy” electric ones came out if my boss didn’t agree with my total on the electric he asked me recheck on the one we kept that was like the one above. When I did it on the older one I always added twice to make sure of my total. My boss would always agree with my total on the manual adding machine over the electric. Bet your salads are delicious, Alice. Marilyn, when I first started working in the natural gas industry we were using the new fangled “fancy” electric versions of the trusty 10 key, but we had some of the older ones still in the storage room. I never actually used one though. Now this would NOT have been B.E. (Before Erik), but he wouldn’t have been out of diapers for long! We would spend half a day calculating the line inventory on the system using thousands of manual inputs. That is something that is now calculated by computer input and updated every five minutes for the guys operating the system. When we went to using spreadsheets on a PC to do the math our supervisor did not trust the PC so he would often make us check it against the 10 key. Funny thing is he only did this when the result was pretty well different than what he had guessed it would be. If the result was close to his guess; then he was okay with the computer spreadsheet! Erik, don’t you dare change your accent I love it!! Marilyn, they came out really well, thanks!! I’m sorry to hear that Ben J. Raber passed away. I have several books that I ordered from his store. Their very personal service (hand written notes when items are out of stock) is unique in this day and age. I hope the store stays in the family. I listened to your interview on Suzanne’s show a week ago, only because I signed up to be notified of HER programming. I wondered why I hadn’t heard anything here, Erik! It was a nice interview. I didn’t know you were her first guest! I didn’t notice an accent, either, but apparently YOU did! I hope to hear you on her show again. You always have interesting info. Alice, I agree with you about today’s young people not being able to readily add/do math without a calculator (etc.). And I, too, remember our local corner store owners (Al and Lottie) adding up purchases on the bag, or even on the butcher paper they wrapped the meat in (he was a butcher, and theirs was more of a general store, with canned goods, a little bit of frozen food, bakery goods, too—he also worked for a local bakery). You brought back some fond memories. You could even run a tab with them (“Just tell your mother she owes 38 cents. She can pay it the next time she comes in.”) Those were the days! I was in a Home Depot store one time and as the young sales clerk (22 years old +/- couple of years)was just finished scanning the last sku number into the system and the total came up on the screen when there was a tremendous lightning crash and all the power went off. For some reason my total remained on the display but she could not input my payment, which was cash. The total was something like $104.81 so I gave her 5 twenties and a ten. She got the most dumbfounded look on her face you have ever seen. It was obvious that she had ABSOLUTELY no idea how much change I had coming back. She had to call a supervisor over, who interestingly calculated it on the back of a small paper sack while the clerk watched. The whole time I was standing there telling them how much the change should be. When the supervisor’s total agreed with mine, the young clerk looked at me in amazement and said “How did you know?” Am I the only one who is disturbed by that? I mean we are not talking trigonometry here. Jethro Bodine could have figured that one out in a flash, but she couldn’t. Amazing. Oldkat I’ve got to admit I recently had to slow down and think a little harder than I would have liked to do some relatively basic fractional calculations (I was tasked with upgrading a 25 lb meat marinate recipe up to a 35 lb quantity by my Amish taskmasters 🙂 )…it took me a little aback. I don’t think I’m near where your clerk was but it made me recognize how little math I do in my day-to-day. Alice Mary, I guess you could say ours was like a general store too. They also did butchering on the premises and even taught me the basics of cutting meat. I did every job in there except the books, the owner let no one else in his books, LOL. We had accounts as well. I loved working there!! When I was real little, even before I started kindergarten my mother would send me to the store as it was just up the street from the house. The owner started teaching me how to count money and would test me. He said he was getting me prepared for when I worked there LOL. I started working there 12 years later!! OldKat, that has happened several times around here. They have no clue how to count back change or figure it out on their own. It’s not totally their fault, they are not taught today. How sad!! About 10 years ago I worked in a Winn Dixie grocery store in Florida for a short spell. I always counted back the change. It got to the point the senior citizens would not go to another check out even if they had to stand on line for a while. When asked why by the manager they told him it was because I counted the change back. He was a young guy and had no clue how to count it back either. I wound up having to teach the other cashiers how to count back change, LOL. I really think we need to get back to teaching the basics in this country.